The rear wall of 83-85 Worth Street may not be much to look at. But then again, the old facade has looked pretty much like that for nearly 160 years. The rows of small, iron-framed windows recall a distant past, when neckties and scarves, pocketbooks and wallets and many other goods were made and wholesaled there, and when this section of Tribeca, once the textile capital of North America, was its home. Though hidden from public view—the LPC normally considers alterations visible from the street—this wall got special protection. But plans for the rear wall were just one part of a much larger restoration plan for the building that was approved and mostly praised by the LPC and CB1. That proposal includes exposing the building’s long hidden cast-iron columns, restoring the marble on the front facade and replacing the front windows with wood-framed windows. New wood storefront doors and windows also would be installed to match the building’s original appearance. The front facade restoration is meant to return the look of 83-85 Worth Street to a time when it stood among a grand row of similar cast-iron, marble-clad loft buildings between Church Street and Broadway. Such structures were part of a four-block section of eastern Tribeca known as Worth Village, the center of the nation’s textile wholesale industry. Before their demolition in the 1960s for the former AT&T Long Lines Building and its plaza, a similar row of buildings stood on the south side of Worth Street. 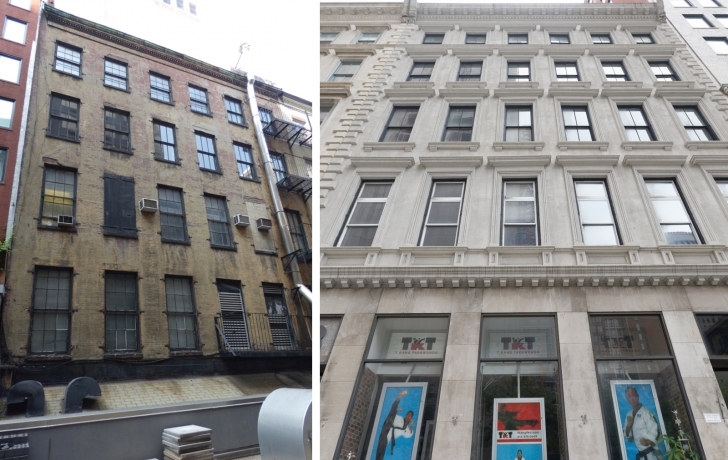 As for the residential conversion plans, the developer, Beekman Real Estate Investment Management, is turning the second, third and fourth floors of the building into single 3,500-square-foot apartments. A penthouse would be added to the fifth floor to create two duplex apartments, topped with a clearstory. Six of the eight commissioners voted to approve the visible penthouse along with the rest of the application—rejecting only the proposal for the back wall.